Diane and I agreed when we started working on the cookbook that we would focus on home cooking. There were people who really wanted us to do a cookbook of Korean royal palace-style food, but we wanted to focus on the kind of food we like best: hearty, simple, and homey. The ten years I spent living in Seoul, Korea, were not the happiest years of my life. That was probably because I was an awkward, dorky teenager. But since I graduated from high school, I’ve enjoyed going home to visit my parents every year. 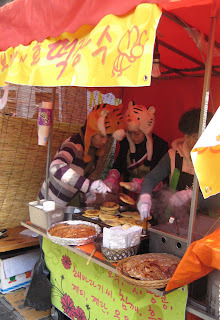 This is probably because with every passing year, I realize how much I miss Seoul street food. 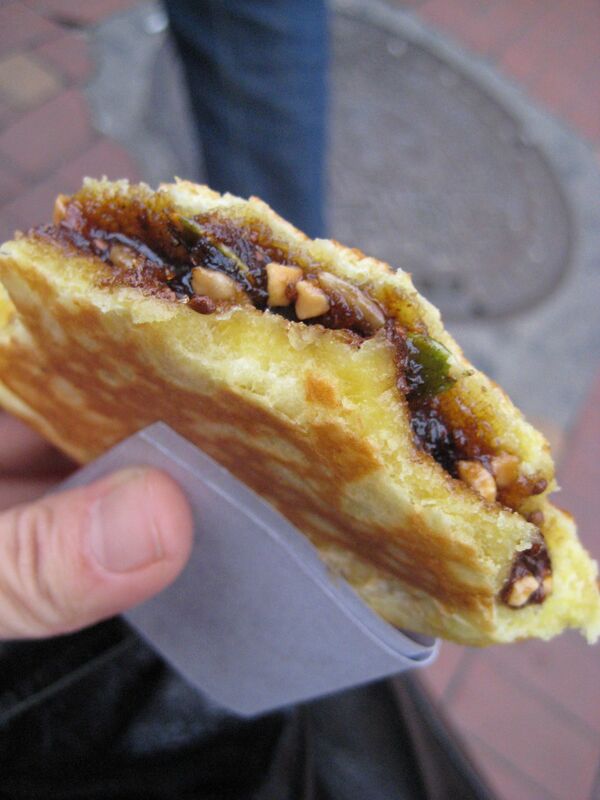 My absolute favorite is 호떡, hotteok, a chewy pancake filled with brown sugar and nuts. The best is when it gets fried on a griddle in plenty of oil, but I’ll even eat the “well-being” ones that are made in special, non-oiled molds. So imagine how I felt when I discovered you can buy hotteok mix in Korean grocery stores! It’s really shockingly easy. The mix contains three envelopes. 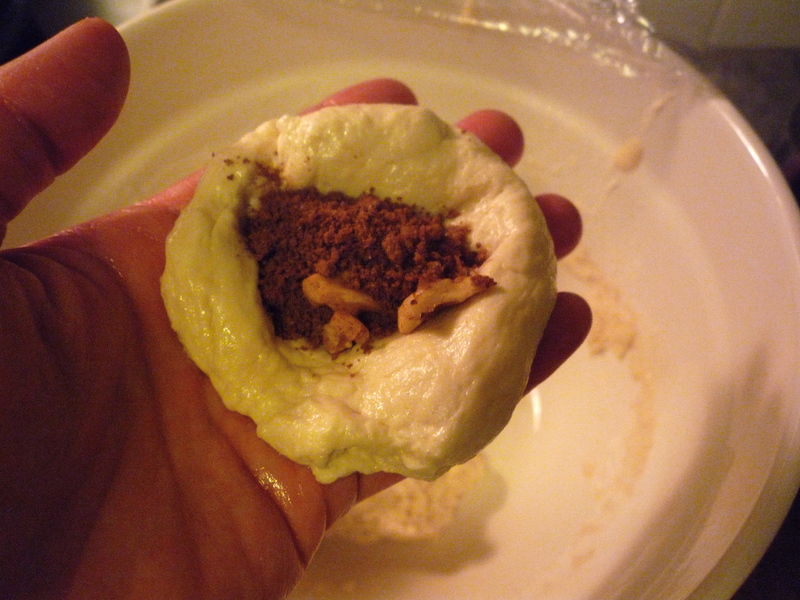 The biggest is filled with some sort of flour batter, with a small one of yeast and another small one of brown sugar and nuts. You take the yeast packet and mix it with about a cup of water. 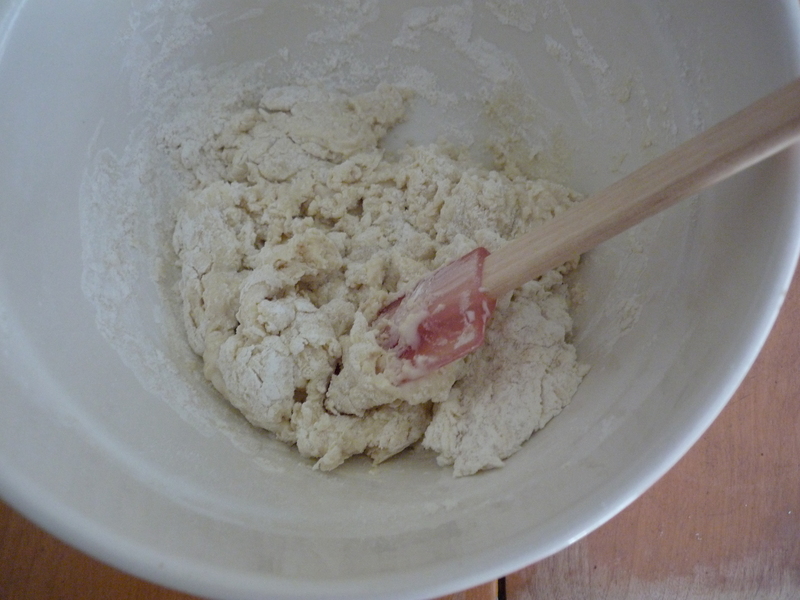 Add the flour batter and mix it thoroughly. Knead the dough a couple of times. Then cover and let it sit for 30 minutes so the yeast can work its magic. The instructions on this packet said something about puncturing the dough to let the gas out, but I just pushed the dough around a little bit and moved on. The dough is really sticky, so you have to oil your hands generously. 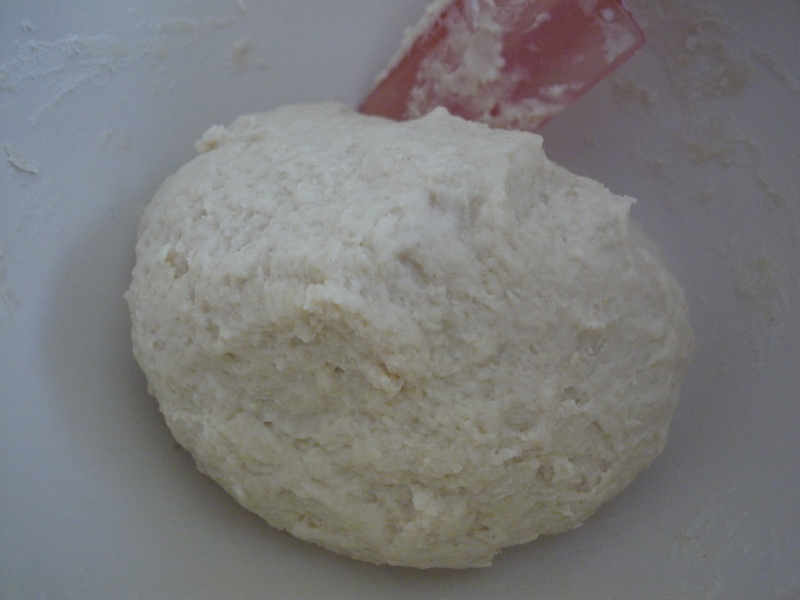 Take a bit of dough from the bowl, maybe about 3-4 tablespoons worth, and roll it up into a ball. Placing the ball in one hand and make a depression in it with your finger, big enough to put in 2-3 spoonfuls of brown sugar. Then pinch the dough around the brown sugar filling. In the meantime, you should be heating oil in a pan. 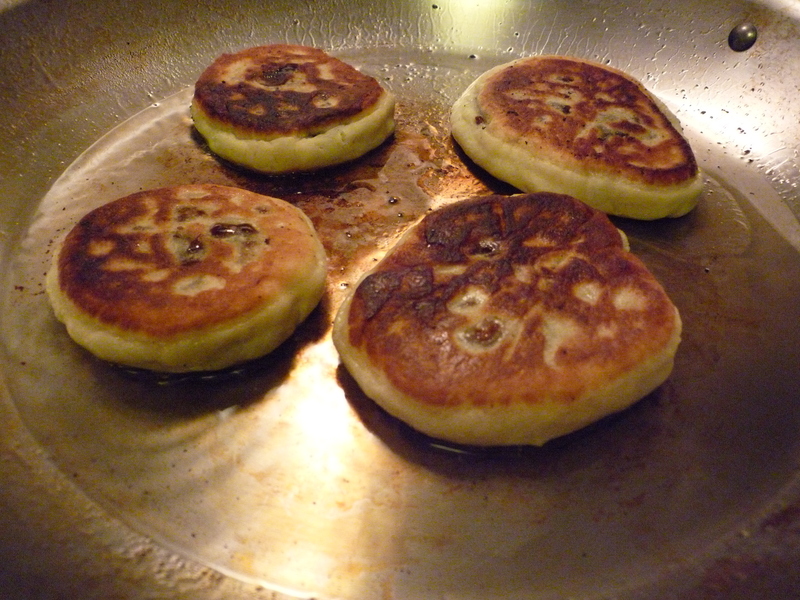 Be generous with the oil and pour in at least half an inch; you really want to fry them like donuts. 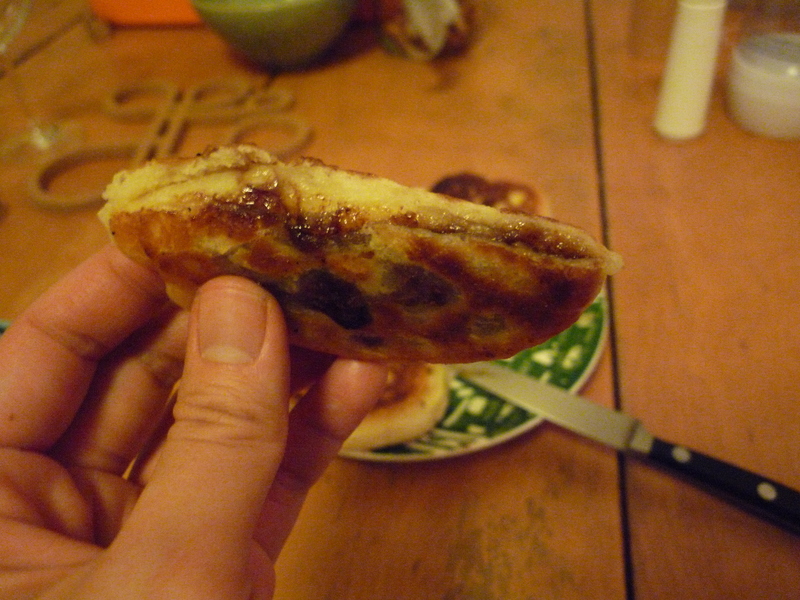 Drop the ball of dough into the pan and flatten it with a spatula. Even if your ball of dough is completely stuck to your hand and it looks like a misshapen blob when you drop it in, you can more or less shape it into a round disk when it’s in the pan. Sticky rice-corn hotteok in Seoul. 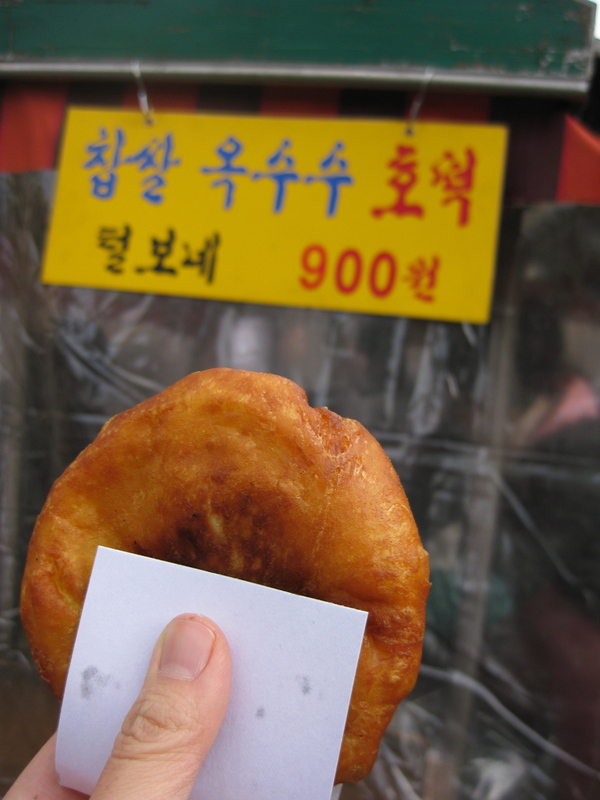 In Korea, the street vendors use a big, flat metal disk to press the dough down flat. In a NY kitchen with only a plastic spatula, we weren’t able to make them look quite like they do in the streets of Seoul. They were much puffier, but they were also crispier all around. Because the texture was a little different, they didn’t taste exactly like traditional hotteok, but really, there’s nothing to complain about when you’re eating a piece of fried dough with melted sugar in the middle. There were quite a few types of hotteok mix at Han Ah Reum on 32nd St. when I was last there, including some that have green tea or sticky rice flour in them, keeping right up with what’s trendy in hotteok culture in Korea. But I imagine they all must work more or less the same way, so if you’re curious and don’t read Korean, it might be worth just following my instructions. I’m normally a horrible snob about mixes. But I can’t turn up my nose at a product that’s given me a taste of something I miss so much. And the fact that the mix is so easy is tempting me to try it from scratch. How proud would I be to include a hotteok recipe in the cookbook! But the better 호떡, hodduk, makers were in Kangnam, who used some newfangled metal mold, so that the outside was perfectly crisp without being greasy, the inside chewy and sweet.